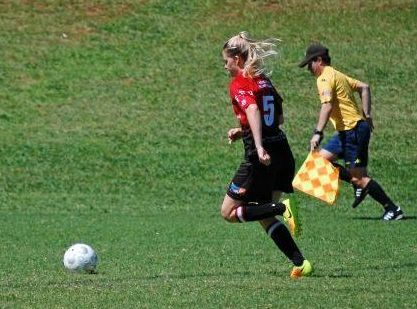 FOOTBALL: The Chinchilla Honeybears were looking to build on a very good performance last week when they took on last year's champions Willowburn in Toowoomba on Sunday. However it was Willowburn that started the game brightly and took an early lead when striker Ebony Kidd was played through on goal and finished confidently. The Honeybears rallied and started to knock the ball around with confidence and levelled the game after Justeen Kruger finished from close range after being played through by Sally Carroll. But that just seemed to spark Willowburn into life and if it wasn't for Honeybears goalkeeper Jess Bolewski, in inspired form, the scoreline could have been a lot worse at half time. With Willowburn dominating possession in the middle of the park, Ebony Kidd scored three quick goals towards the end of the first half to send Willowburn into the break leading 4-1. After some soul searching at half time, the Honeybears in the second half looked to make a game of it. Kim Preim was the first to threaten in the second half when she found space in the Willowburn penalty area but hit her shot straight at the Willowburn goalkeeper. Annie Johnson was causing Willowburn problems on the right wing, however Johnson saw her shot from a tight angle slice wide. Willowburn were always a threat going forward though and when Kidd was through on goal the impressive Bolewski again frustrated the striker with a good save from close range. However, Willowburn did get a fifth goal when Abby Van Niekerk strolled through a tired Honeybears defence and fired into the top corner, giving Bolewski no chance. The game ended with Willowburn the convincing winners 5-1. Honeybears coach Tim Taylor said the Honeybears started very slowly mentally, which didn't cut it against a top side like Willowburn. "You can't afford to do that, otherwise you will get punished,” Taylor said. "When we levelled the scores at 1-1 I thought we would kick on from there, but we took our foot off the pedal again at the end of the first half. "Jess played so well in goal - the first half could have been very embarrassing if it wasn't for her. "At half time I said to the ladies that we have to get back into the fight. I don't think we competed well in the first half, we gave them too much time on the ball. The Honeybears will look to dust themselves off when they take on USQ in Toowoomba this Sunday in a game that is shaping up to be crucial for both teams in their hopes for finals. With the Honeybears just ahead of USQ on goal difference, both sides will be looking to close the gap on the top four. "We have had a tough run of fixtures against the top four sides and didn't pick up as many points as we would have liked, so now we are playing catch up. So this weekend is very important for us,” Taylor said.